just a guy with a skillet, cooking his heart out. A celiac’s kryptonite but manna from heaven for the rest of us. What’s not to love about a good pizza? 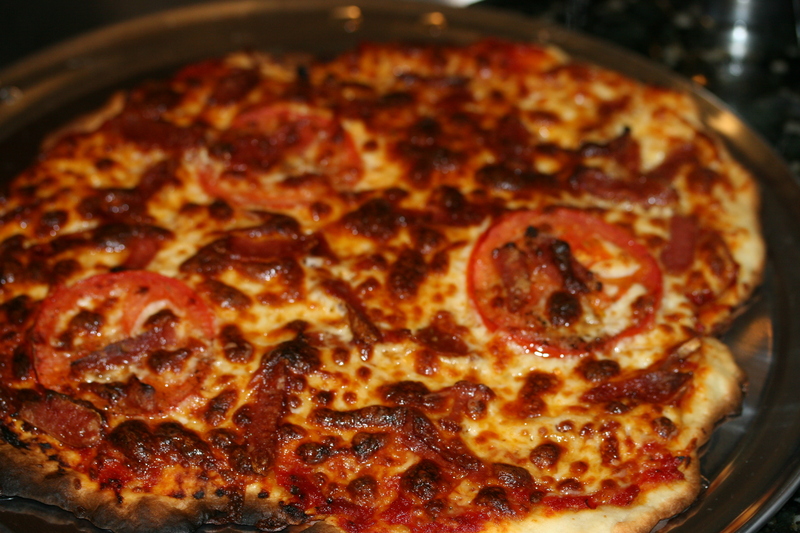 Making pizza at home always seemed like an exercise in futility. Is it possible to match the greatness of Tony’s in San Fran, Grimaldi’s in NY or Cane Rossa in Dallas? Likely not, but I am going to try. I have scoured the internet for recipes and even armed myself with 00 Italian flour and yeast. However, out of the gate I am handicapped because I don’t have a wood/coal fired oven or even a Green Egg that gets me over 500 degrees. Several attempts in to this and I can say I am getting better. My sauce is close, the dough flavor is there. Making the dough and cooking it have been my challenge. 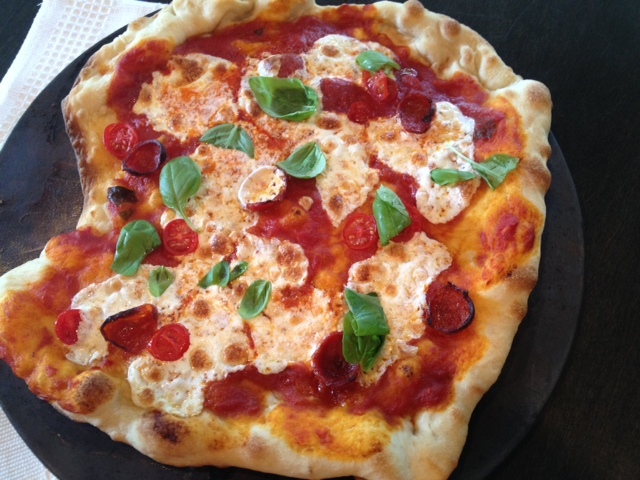 Tried it on the grill… was a disaster due to that high gluten flour and no pizza paddle. I basically heaved it onto the pizza stone at 500 degrees so it bunched up in places and had no thickness consistency. Also I tried the preheated oven at 500 for 30mins. When I get it figured out better I will happily share some recipes. I am growing some sourdough starter to experiment with crust flavors. I was watching “The Best Thing I Ever Made” on the Food Network. 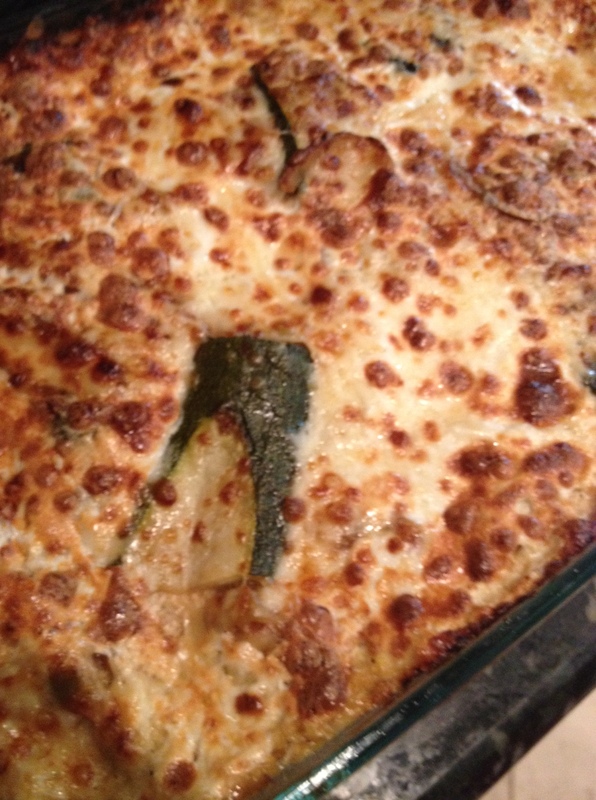 Marcela Valladolid raved about her Pablano Lasagna. I whipped one up and it didn’t disappoint. However, I thought I could make a few tweaks by bumping up the corn, pablanos and adding chicken. 1. 24hrs before cooking, marinate your trimmed chicken in your chicken stock, Rotel, squeezed half lemon, cumin, ancho chili powder and cayenne. 2. Day of cooking. Char your pablanos, jalapenos and corn on the grill, stove or in oven (broil). You want the peppers burnt/black/blistered. I also like my corn to have a nice tan too. 3. 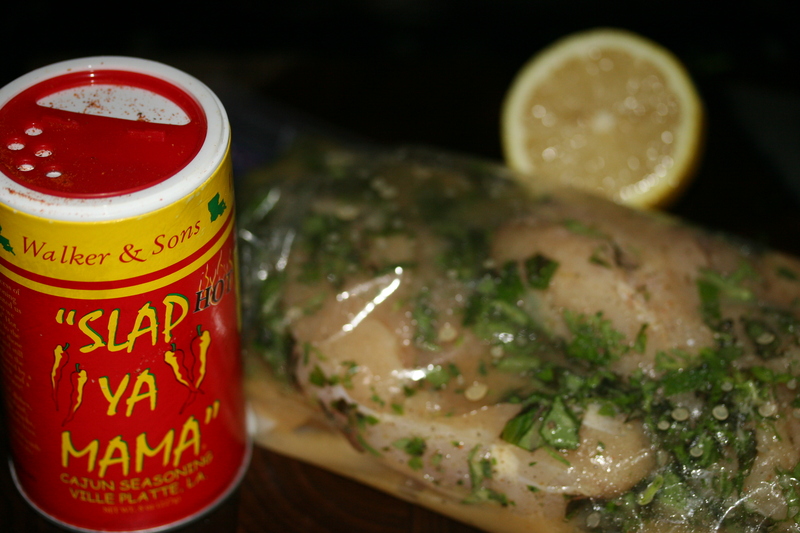 Save your marinade. Go ahead and throw your chicken on the grill (medium/hot 400 range) and get some nice marks on the them. You will saute them later so don’t cook them fully on the grill. 4. Remove peppers and put them in glass bowl and cover with plastic wrap and let them steam for easy skin removal. I like to keep a little on for taste. 5. Once your corn and peppers are cooled to handle. Take a knife and carefully cut of the corn kernels and put them into a bowl. Also remove the clean skin of the peppers until you have mostly the green flesh. Then filet them open and cut into strips removing all seeds and membranes. 6. 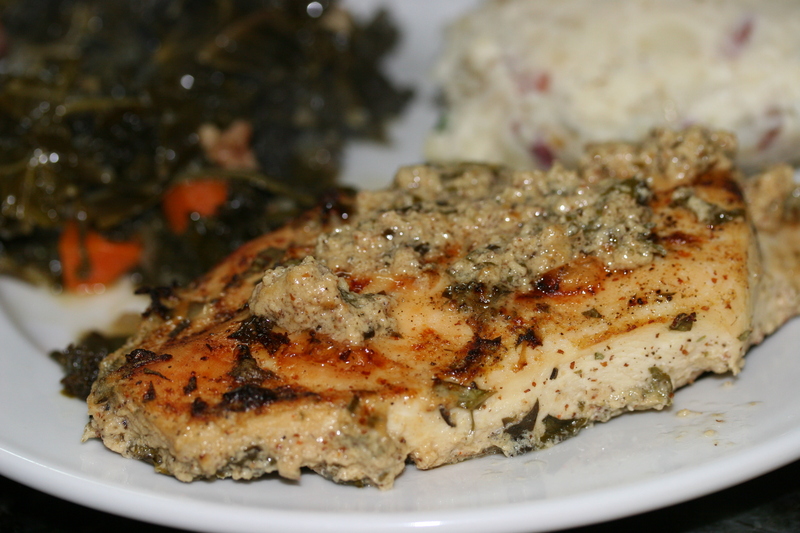 Go get your chicken off the grill and set it aside. Again, we just used the grill for marks not for fully cooking the chicken. 7. 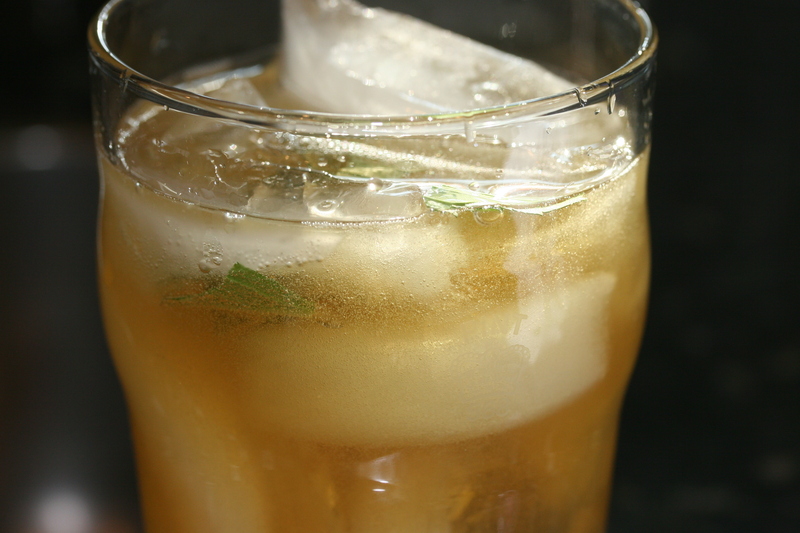 Pour yourself a glass of tequila, squeeze a lime and hit it with some agave or simple syrup (which you should always have at the ready). Relax a little. 8. Two pots on the stove. First pot add 2 tsp of butter and your minced garlic on medium heat. Simmer for a minute and then add corn ( i used about 3.5 cups of corn) and diced jalapenos. Stir a little and then add the heavy cream, thyme and pinch of cayenne. 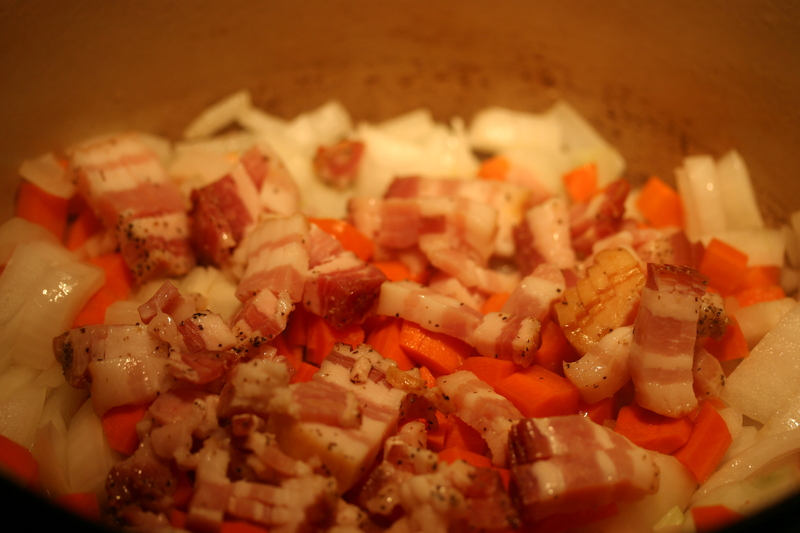 Reduce heat and let the flavors meld. 9. Second pot: (this is where I could get a lecture but I am alive because heat kills bacteria). Then slice your onions and chicken very thinly and put them into the pan/ pot and let it simmer with 1bs butter. Add some marinade or a little chicken stock to keep it moist. 10. Take your corn mixture and put it into the blender (be careful it’s hot and will blow your lid off so let it vent or cool) Blend until smooth. Now all we do is build the lasagna. Preheat oven to 350. Pour out liquid from our chicken and onions, slice zucchini into thin strips. 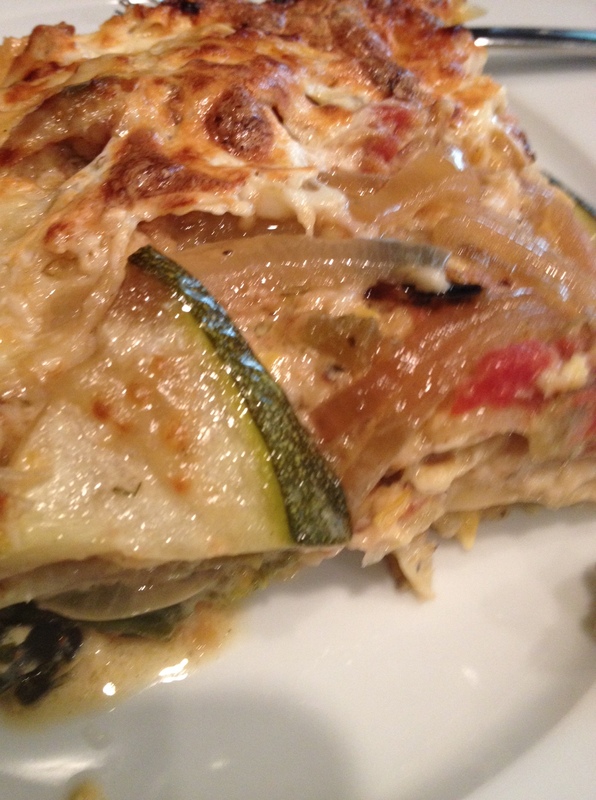 Take a 9x 13 glass baking dish and ladle corn mixture on the bottom, then three pasta sheets to cover the bottom, then add your chicken and onions (without the marinade – we just used it to keep it moist and cook in some flavor), and now your sliced zucchini and pablanos. Repeat 2x lasagna, corn, chicken, pablanos and cheese, cover in foil. Bake it for 45/50 mins. Turn on your broiler, remove foil and let it go for 10 mins or until cheese is brown and bubbly. 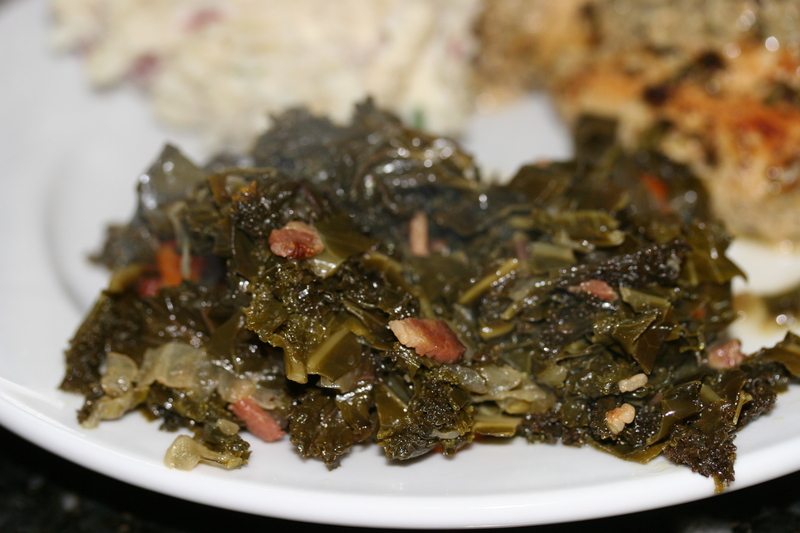 The herbs really make this dish with that touch of zing from coarse grain mustard and the juiciness from the roasting make this dish stand out despite how easy it is. 1. 1 Day in advance of cooking …trim chicken breast to your satisfaction and place it into a ziplock bag, add everything but the herbs with a pinch or two of salt. 2. 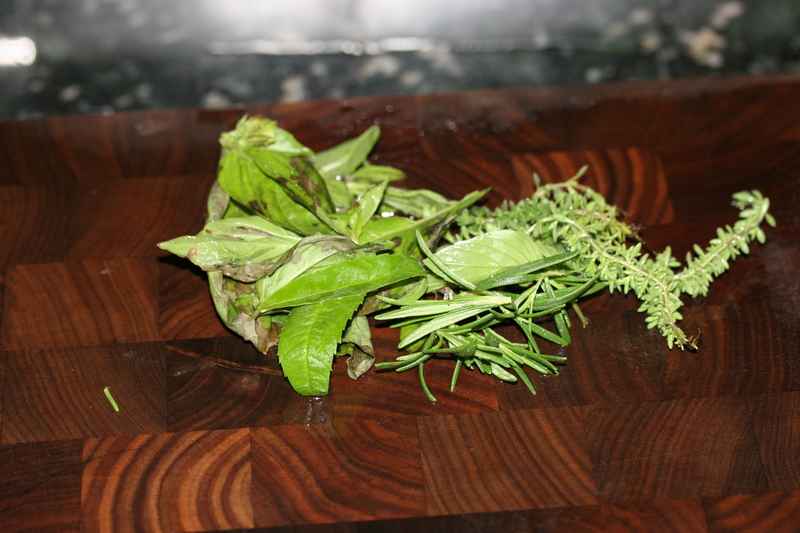 Day of cooking… chop herbs and add to bag while you work on your other sides. 4. Roast at 400 for 40-50 mins until juices run clear and chicken is done. 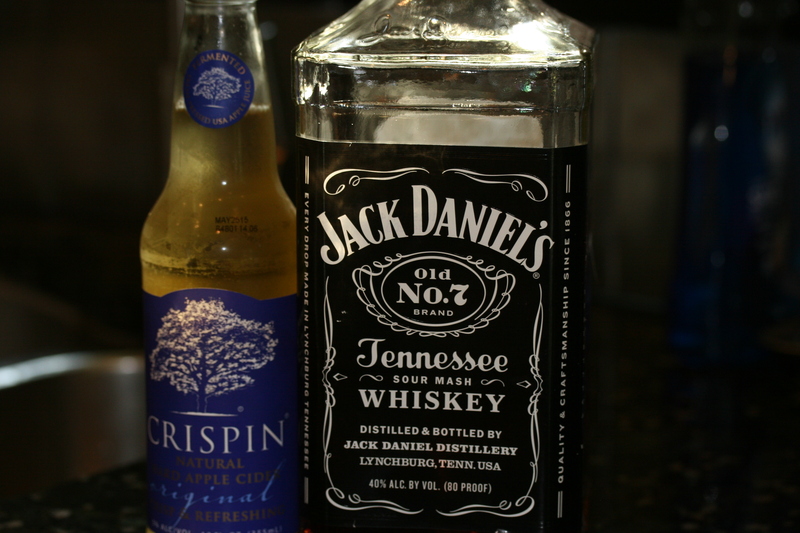 Hard Apple Cider ( Crispin ) pour three quarters in a pint glass with 2 shots (or 10 second pour count) of Jack Daniels and torn mint on ice. Mashed Potatoes a great compliment to “greens”. 1. Clean potatoes and cube into large equal pieces so that they cook together. I keep the skins on. 2. Bring pot of water with 2-3 pinches of salt to a boil and add potatoes. Cook until fork tender. 3. When done empty and drain into colander. 4. Dice Shallot and add to heated pot the potatoes were in and soften with a pinch of salt and a tbs of butter. 5. 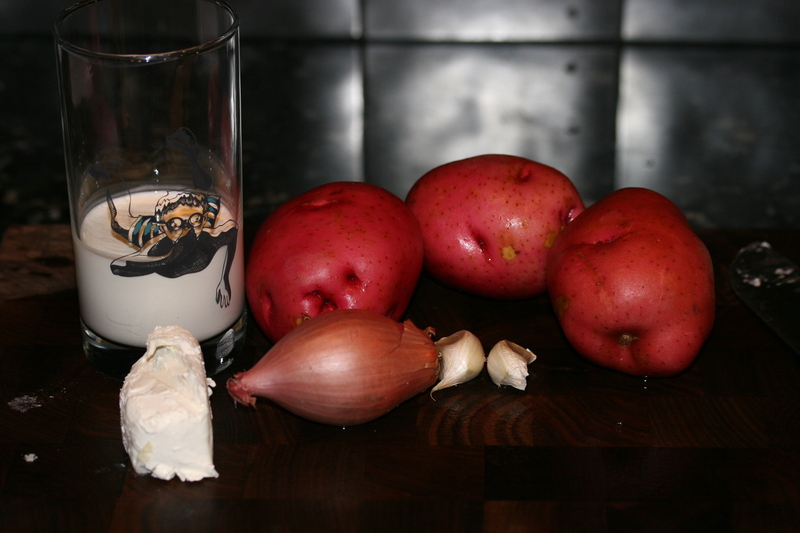 Add potatoes back into the pot with the shallots with heavy cream and cream cheese. 6. Mix to your desired consistency (add more cream if too dry) and add your herbs. 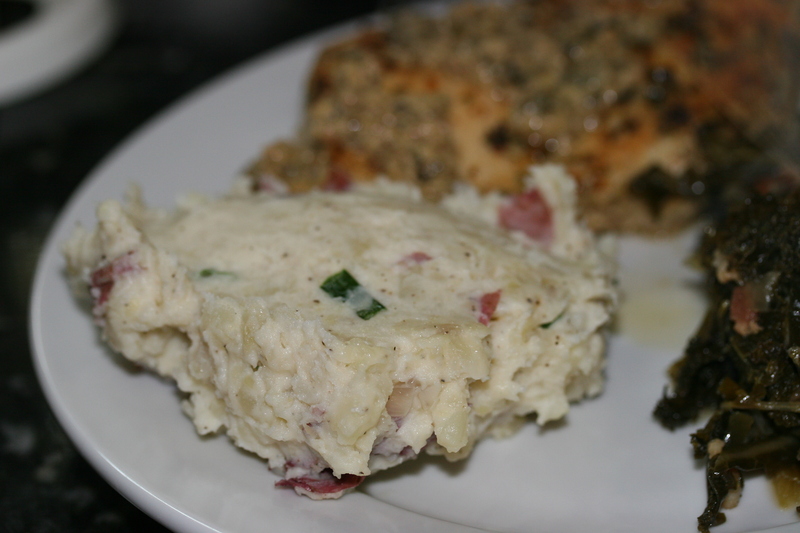 Super easy “base” mashed potato recipe that can be altered with various cheeses, vegetables and spices. The cream cheese, real butter and heavy cream set it apart. If you wanted to remove some calories you could dial back those three items and replace with skim milk or even greek yogurt (tangy). 1. 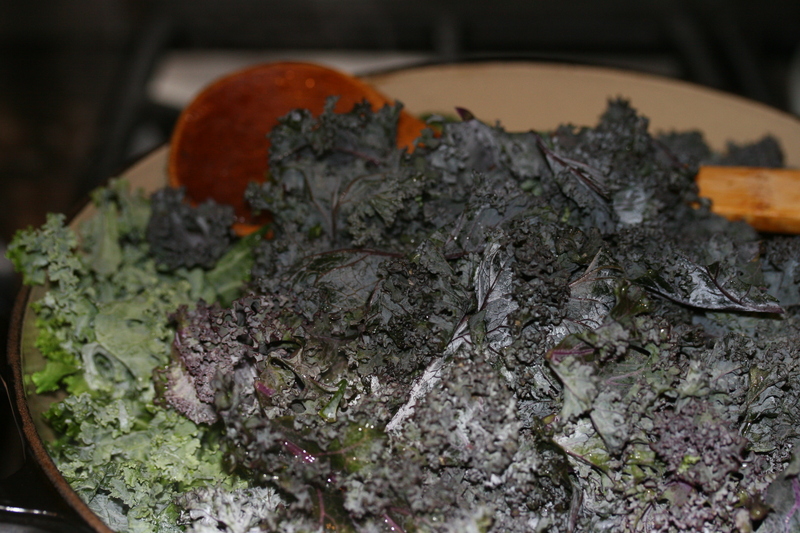 Remove the spines from the greens and curl them up like a cigar. Cut thinly into ribbons. 2. Heat a large pot on medium heat. 4. Add greens (spine removed, rolled and sliced into ribbons) Don’t worry it will look like you have too much but it will wilt down a lot. 5. Add two cups of chicken stock and cover pot for 30-40mins. Mine cook about an hour but I keep my eye on the moisture level and add chicken stock as needed. Beer might be a good option after the first two cups of chicken stock. Also adding in ChowChow or a relish is nice at the end. 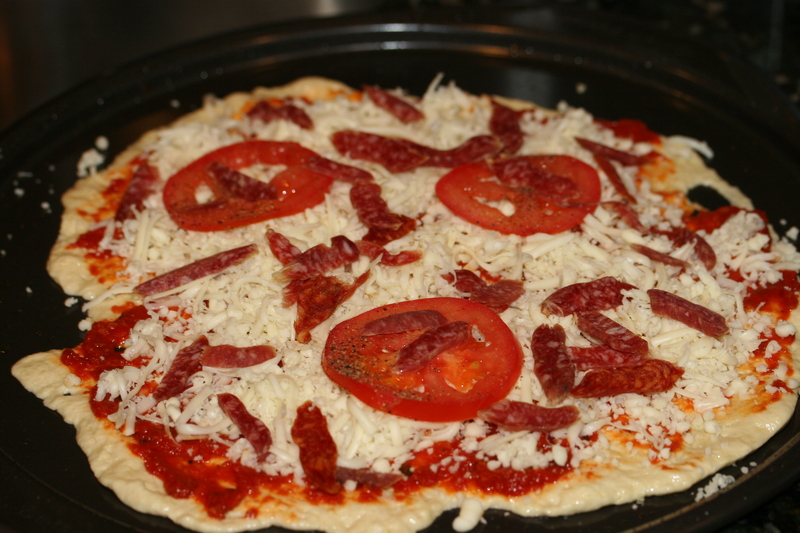 I have mentioned earlier that I was working on my pizza making process. I have had several “at bats” and pop flied, fouled or even struck out several times. 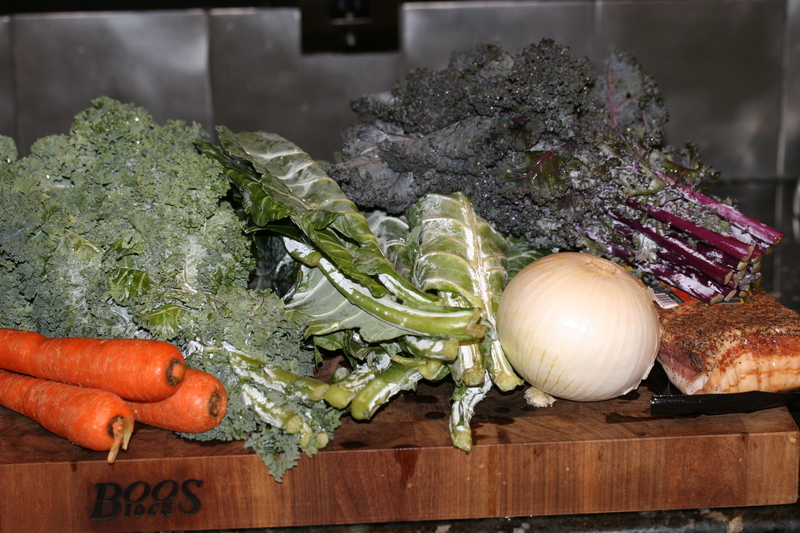 As I mentioned early on, I would only post a recipe that you can make with some level of success. I have tried dough recipes from Bobby Flay, Jamie Oliver, several online but I had decent success with Tyler Florence’s recipe. If any readers want to share your secrets I am open to them. As I mentioned on my Sourdough pizza recipe I posted a few months ago, my oven and grill tap out at 500 degrees. Pizza temps prefer 700-1000 degrees. At least the ones I like. So I bought a little Pronto Pizza oven that is an outdoor gas oven that can get me to 900 degrees. Works great. My favorite crusts are thin but not cracker crunch but instead have a little chew or “tooth” to them. In the Dallas area Campisis and il Fratellis are the ones I strive to replicate. I think somehow they are getting more fat into their dough. My areas of improvement are getting my dough to stretch evenly without holes and then getting the damn dough off the pizza peel. I have tried corn meal and flour but seems like there is always a sticky area that clings onto my metal peel. So last night I decided I am going to go with a non-stick pizza pan covered in olive oil to impart more fat. It was chilly outside which created an cooler spot at the mouth of my oven. I turned it about 1min late and burned an area but I like mine well done anyways. 1. Make the Dough by getting your yeast started. Warm 1 cup of water to about 100 degrees and stir in the sugar and yeast and pour it into the mixer bowl. Let it sit for about 10mins. The yeast will activate and get frothy. Turn your oven on to 150 and after a minute shut it off. Creating a warm sealed place for the dough to proof. Put your proofing bowl in the oven to warm it as well. Add your flour and salt and a glug of olive oil and mix for about 10mins. It should be tacky but not sticky. Make into a ball, cover with olive oil and then plastic wrap and a towel. Put into the oven and let it proof for 50 mins. Punch it down and divide into two balls. Turn the balls for a few minutes with olive oil on you hands. Cover both with plastic and a towel and let it rest and relax for 10mins before making your pie. We froze one ball for later use and split the 14-15inch pizza made tonight. 2. Sauce: Olive oil and minced garlic in a small sauce pot on medium low heat. Cook for a minute or two and then add the rest of the ingredients. Simmer and stir while the dough is proofing. 3. Tonight I oiled a non stick 15inch pizza pan and tried to spread my dough out. then sauced it, topped it and stuck it into my pizza oven for 6mins. and turn another 6mins or until you get it to the “doneness” of your liking.